I’m delighted to say the reaction to my ‘Voice’ appearance continues to be positive. Well it’s simple. A few years ago the renowned Tenor and Vocal Coach David Maxwell Anderson, agreed to give me a series of lessons. As the course progressed I could feel my singing voice, long neglected, beginning to improve. A couple of years later I realised I had to find a way to tell the world I was becoming a proper singer. I applied to audition under my real name, Bernard Quinn. I didn’t tell my family or my manager in case they tried to talk me out of it. The auditions continued and eventually I found myself singing to an audience of seven million people on BBC 1. "What a fantastic end to the year ! ‘Topping the Bill’ at the Royal Variety Show, The TV Show that is watched by 150 million people around the world An amazing night to walk down to the applause of the worlds biggest Stars including Lady Ga Ga, Robbie Williams, Gary Barlow and Sting, to name but a few. “Clifton is a certifiable genius…This warm uncynical lunatic in the funny suit is the spiritual father of Vic Reeves, Harry Hill and Johnny Vegas….He’s not just a nutter with a flightless-bird fixation. Au contraire: Clifton is God”. Heeding Dawson’s wise advice, Bernie found continued success both in Cabaret, Theatre and Television to the ultimate high point, being chosen for the Royal Variety Show where the Queen was reported to be crying with laughter as he ran amok aboard his Ostrich. This led to many more TV appearances alongside a burgeoning career in all forms of light entertainment. His time aboard the QE2 took him around the world several times where his visual humour transcended all language barriers. Bernie was alongside Peter Kay in the ‘Amarillo’ video which went to number one and stayed there for several weeks and he recently hosted a Radio 4 special, I found a Tenor… Richard Tauber Revived, giving him an opportunity to reveal his oft neglected singing talent. 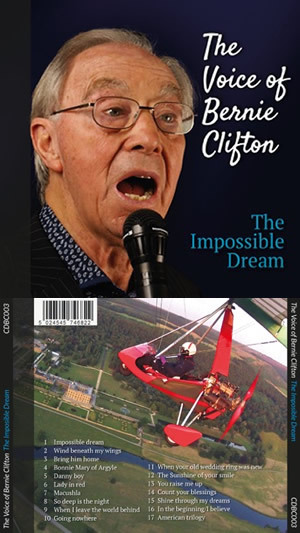 Apart from his weekly ‘Liveish’ show on Radio Sheffield and constant ‘gigging’, he plays trombone with the England Football Band and never misses a chance to take to the skies over his north Derbyshire home in his beloved Microlight. A selection of Bernie's classic comedy capers for you to enjoy. Copyright © Bernie Clifton. All Rights Reserved.